I’ve spent a lot of time this year experimenting with data collection and monitoring student satisfaction and achievement using traditional and digital technologies. After a recent professional development where the staff at my school discussed the qualities we would want in a leader/teacher, I started thinking about asking my students what they wanted in their own teachers, and what qualities stood out as being the most valuable. This came together in an activity that I did during Genius Hour yesterday and I wanted to share it because it was fun, eye-opening and a good way to start the school year. Unfortunately we’re right at the end of the school year in Australia, but that just means that reports are done and it’s a perfect time to experiment with ideas for the future. 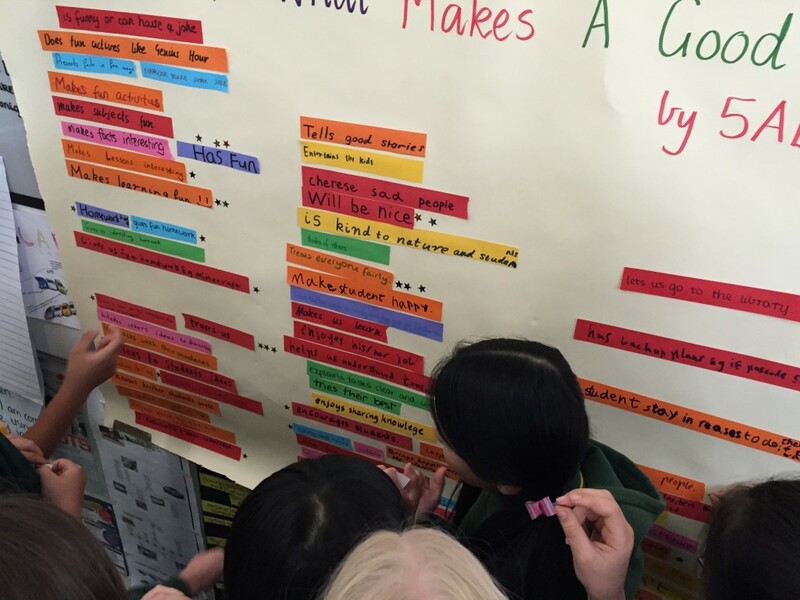 First, I handed out strips of colourful paper and asked the students to complete this sentence: ‘A good teacher …’. I gave one example of my own but then encouraged them to write anything they could think of. They had five silent minutes and weren’t allowed to talk about their ideas (except for the EAL students) and the strips were anonymous. I went into the activity with no preconceptions about what they might write, just a hope that they would take it seriously. After five minutes most of the class were still thinking and writing so I gave them a couple more minutes, then they gave their strips to me and went on with Genius Hour. A couple of students asked if they could help Lynda (an aide in my room) and I sort the strips, so we tried to make categories and removed any answers that were identical. I was blown away by some of the answers, such as ‘enjoys their job’, ‘wants to share knowledge’, ‘lets us be creative’, and ‘doesn’t make useless tasks’. All the things I want to do as a teacher! 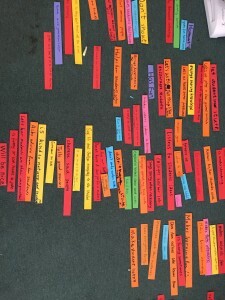 And my favourites – ‘is funny’ and ‘tells good stories’. Maybe not quintessential parts of teaching, but certainly qualities of my most memorable teachers at school. Then we stuck the strips on a big piece of paper and taped it to the board. After Genius Hour the students were given three star stickers and asked to star the ideas they thought were most important. So what was most important? By far ‘being fair’ and ‘making learning fun’ were the top hits. If I’d been asked beforehand what I’d thought the students would say I’d probably have picked these two as well, because it’s what is important to me too. It was a great discussion to have and I could tell the students were pleased to be asked for their feedback. I spend all day telling them what I think of their work and behaviour, why not give them a chance to give me some feedback? The highlight of the day came when we had our ‘School Value Superstars’ session (students nominate each other for stickers in the six categories of the school values) and one of the boys nominated me for a sticker because he said I did all the things on the list. Well, my heart nearly exploded. Then one of the other boys started to say ‘Well, actually Miss Lenon doesn’t… ‘ but I told him to be quiet and let me enjoy the moment ;-). I’ve stuck this sheet on a noticeboard in the school because I love, love, love it. I highly recommend the process to other teachers. I’m looking forward to seeing whether next year’s class makes a similar list or comes up with very different things – and I look forward to using it as my own guiding principles throughout the year and doing an accompanying poster about what makes a good student and then the class and I can work together to become better. 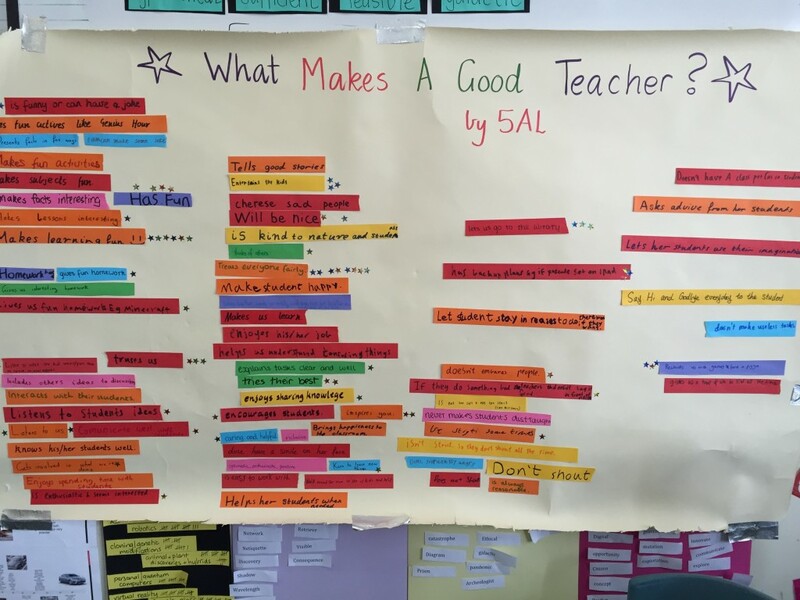 This entry was posted in Uncategorized and tagged Australia, first week activities, humour, Melbourne, philosophy of teaching, Professional Development, What Makes A Good Teacher? by amandalenon. Bookmark the permalink. Loved what this provided to both teacher and students in terms of feedback and voice. It also reflects the safe environment that exists in this classroom that students could be open and honest and the teacher equally comfortable with receiving constructive feedback from their students.